Even though my softball season ended some 5 months ago I figured it was worth writing about as I played so much of it. My previous team was still playing our double headers and a friend asked me to play on a co-ed team with him and his wife. It was just one extra game a week and figured it would be a great way to get extra swings in for my mens league. However, playing on the co-ed league would lead into playing way more than I intended. How Many Softball Games Did You Play in 2010? I still cannot believe that I played in over 115 games. What’s crazy is some of my friends played over 150 as they also do tournaments on the weekends. My Wednesday night team plays at Baumgartner Park which is ran by the City of Sterling Heights. It only has two fields and the only people who show up are the players. My Tuesday co-ed team played at Liberty Park which is a very nice privately owned facility that has 11 fields and a bar to hang out at. It was my first time playing there and the fields are much nicer than the city owned parks. While playing for the co-ed team I started running into some old friends who would ask me to sub after our game or that they were on another team on Thursdays and needed somebody to play. It was not every week but from April til August I was averaging 6 games a week. When the second season kicked in I was asked to play on a team and pretty much permanently subbed for my brothers other team. It was kind of nice to only do two nights a week from August til early November. I still subbed occasionally on Thursdays. With my Beachbody Coach business going in full effect I could re-arrange my schedule to be able to play every night. I guess that’s one nice thing of running your own business. Unfortunately, no. I still do not know how my Wednesday team has not won it over the past 3 years. We are a very complete team but just cannot seem to get it done in the playoffs. The co-ed team finished second. Our girls improved over the season and it was fun watching them build their confidence batting and fielding. The teams I was not a official member of but played more than the guys who asked me to sub for them both finished in dead last. Both teams problems were that everybody was trying to hit the ball out of the park and unfortunately it was an out if you do. Plus, we played with a ball that was softer so it would not fly out. Many balls that were hit would end up being pop-ups. It was not uncommon for us to be mercied by the 4th inning. You have to be so good to place a ball on the warning track that its just not worth trying. My second season team did very well. It took us two weeks to get use to playing as a team but we went on a tear after that. Too little to late though as we finished in second place. I also played in a co-ed and mens tournament. Co-ed team only won one game. The mens team won 2 games. Both were fun. The other tournament I played in was called Oktoberfest so some people dressed up in costumes. 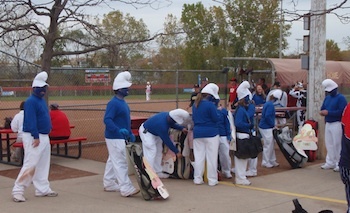 A buddies team of mine dressed up like WWF Wrestlers and you even saw a team of Smurfs playing softball. It was a long day and the hour or two breaks in between games of course made time for beer. I lasted three games before having one but I could tell it took a little out of me. Never really liked playing sports where I have to run with beers in my stomach. How Do You Think You Played? I definitely improved through out the year primarily because of how much I played. Short stop was the place I played the most. Fielding was better this year than previous years and so was my batting. My goal was to get on base more than half of the times I got up. Singles and doubles were my bread and butter and most of the time I’d hit it. Having new gear definitely helped. Bought a pair of Boombah turf shoes and pants to look more “official” as my brother would say. I used to use an old set of soccer cleats (which killed my knees) and shorts before. I hated sliding and my teammates would get on me when it was a close play and I did not slide. I told them I would only try to get an extra base if I knew I was going to get there. I was gunned down 2 out of the 20 or so times I tried. The shoes kept my knees from hurting and the pants surprisingly kept me cool even on the 95 degree days we played on. For some reason I like to slide head first so bloody knees don’t usually happen that much. Did hit my first over the fence home run at Liberty Park. As soon as I hit it I was like oh man get down. When I rounded first base I heard it hit the bushes and was instantly booed from my teammates as it was an out. Sad thing was that it happened on my co-ed team and none of the guys from my mens team got to see it. Cleared the 300ft sign by at least 10 feet. Probably hit the fence 3 times through out the summer. Its not apart of my game though and I only try to do it if I see the outfielders are playing in on me after hitting singles on my previous at bats. Had an interesting game where we were down by 9 runs in the top of the last inning, scored 10, and held them scoreless for an amazing come from behind victory. Did P90X, the Insanity Workouts, and Tony Horton 1 on 1 workouts help your play? Yes, big time. I had just finished the P90X and Insanity hybrid workout in Jan. 2010 and continued that until March when I bought the Tony Horton 1 on 1 Vol.1 workouts. I really liked the Plyo Legs, 30 / 15 workout, and Killer Abs from the 1 on 1 series. Man were those tough. Killer Ab was my ab workout of choice for at least three months. A normal week for me was working out 5 days during the week around noon and then playing double header softball games Tuesday through Thursday night. I mixed in workouts from those programs over the summer along with at least one day of P90X Yoga X a month. I noticed much more strength in my arms and shoulders. That home run (out) I hit over the fence would not of happened two years ago. I’ve gone from hitting 260 foot pop ups to hitting that one 310 feet. I also felt like I had a little extra juice when throwing to first from short stop or making a relay throw. I never really got tired either. My brothers other team has a lot of guys who are 25-28 on it and some are out of shape. One of the guys came up to me and asked me if I was 23 years old because I never looked tired. When I told him I was 30 he was shocked. “What do you do to stay in shape,” he said. “P90X, ever heard of it,” I replied. It’s just more enjoyable playing when you are in shape. Even if it is just a beer league. I’ve already put on another 5 pounds of muscle since the season ended so I’m right at the weight I want to be at. However, speed is always been a enemy of mine. My brother always says I look like I should be able to run faster then what I do. I had success with Insanity and could do it again but I am really excited for the Insanity Asylum workout that is coming out in March 2011. It looks like it will be the exact workout program I need. Not saying I could not do more with P90X or the Insanity workout again, but its time to switch it up. My goal is to be quicker on the base paths and also in the field. 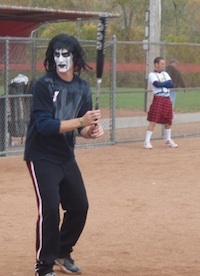 There were a number of times that I could have knocked down a ground ball if I had just been a little bit faster. I’m also going to be practicing on hitting to the opposite field. Need to cut down the 2 beers after the game to just 1. It adds up when your playing three nights a week and then going out on the weekend. All in all I had a great 2010 playing softball. Made a lot of new friends and caught up with some old ones. I did not turn into angry softball guy either. Going to continue to work on my health and fitness so I can enjoy playing softball in 2011 and beyond.